If you’re in for a cold winter just about every winter these layers can tough out the cold. Nearly all breeds of chickens can survive chilly winters with insulated henhouses and supplemental heat, but why bother taking heroic measures when there are chickens developed for Northern living that thrive in the cold and lay through the chilly winter months? These winter-hardy breeds have several traits in common. Because they’ll be cooped up when it’s bitterly cold, they have to get along in a limited space. Flighty, pugnacious breeds are terrible candidates for confinement housing; calm, easygoing breeds work best. It’s no coincidence that breeds that hail from cold-climate countries and regions tend to be large chickens with lots of fluffy down under their feathers. Most have compact combs and smallish wattles, too. A large body mass and plenty of insulating feathering helps keep them warm. Compact combs and wattles are less prone to frostbite than large, multipointed single combs and long, dangly wattles. Northern breeds were also selected for hardy constitutions: They’re tough! Keep in mind that not all winter-hardy breeds lay eggs year-round: Brahmas, Chanteclers and Wyandottes, however, do. Brahmas are the big, cuddly queens of the winter layers. Calm and friendly, they make great pets, and although the roosters are relatively slow-maturing, they can make mighty tasty eating. One of the heaviest breeds of chicken, Brahma roosters weigh an average of 11 pounds, and hens tip the scale at 9 pounds or more. They come in three American Poultry Association recognized colors: Light (both sexes are silvery white with dark tails and black flecks on their necks and leg feathering); Dark (roosters are black with silver accents; hens are silver-penciled steel gray); and Buff (same pattern of black as Light Brahmas but with a golden buff base instead of white). However, other non-approved colors exist, such as black, white, gold and blue. Brahmas are broad-bodied birds with short necks and beetling brows, and they have pea combs, small wattles and yellow skin. The Brahma is a heritage chicken named for the Brahmaputra River in India. 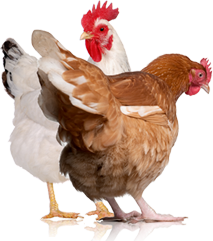 American breeders developed today’s Brahmas in the years between 1850 and 1890 by crossing large Shanghai chickens (now called Cochins) from China with Gray Chittagong fowl from India, then selecting for qualities, such as immense size, comb type, meatiness, laying ability and hardiness. In 1852, American poultryman George Burnham sent a gift of nine of his best Brahmas to Queen Victoria of England, where they were an instant success. Originally called Chittagongs, Gray Shanghais and Brahmapootras, Brahmas got their current name from The Northern Farmer publisher, Thomas Miner, who began calling them that during the mid-1850s and the name change stuck. The APA recognized Light and Dark Brahmas in the first APA Standard of Perfection, published in 1874. 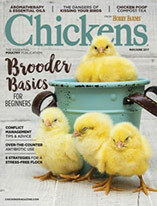 It’s still one of the finest cold-climate chickens in North America, though its heavily feathered shanks and feet can be a disability in damp, muddy conditions when mud on their legs and feet can freeze, leading to frostbitten toes. Brahmas do best when kept indoors when it’s cold but soggy outside. Brahmas are respectable layers, averaging 140 or more medium to large, creamy brown eggs per year, laying right through the coldest winter months. Hens tend to become broody, especially in the spring, and they’re fine, attentive mothers. The Chantecler breed was developed in the early 1900s by Brother Wilfred Chatalain, a monk who resided and worked at the Oka Agricultural Institute in Quebec. “He was in charge of the poultry yards there, and one day gave his visiting father a tour of the facilities,” says Mike Gilbert, secretary of the Chantecler Fanciers International. Chatalain worked on his creation from 1908 until 1918 when the White Chantecler was released to the public. It was snow white in plumage with yellow skin and shanks, sported a small cushion comb and very small wattles, and was rugged enough to withstand harsh Canadian winters. The APA formally recognized the new breed in 1921. Meanwhile, John Wilkinson of Alberta had begun work on a similar chicken in the late teens and early 1920s, but in various colored varieties. He petitioned the APA for recognition of the Partridge Albertan in 1935, but the standards committee decided the Albertan’s features were too similar to the White Chantecler’s to be considered a different breed. To Wilkinson’s initial disappointment, the APA recognized his creation as the Partridge Chantecler, instead of Albertan. Similarly,buff, black, Columbian and other varieties were worked on by Wilkinson and others, but they have never been officially recognized. A number of other varieties are currently in the process of being developed as well. A buff variety was developed by Walter Franklin in the U.S. in the early 1980s. Franklin used Buff Cornish, Buff Wyandottes and Buff Plymouth Rocks to develop this newest variety. Although this variety is perhaps the most widely distributed by commercial hatcheries, it’s not yet recognized by the APA. With few exceptions, Chanteclers are docile, friendly chickens. They’re big, though not Brahma-huge: Roosters weigh about 8½ pounds, and hens weigh roughly 6½ pounds. They mature relatively fast and have large, meaty breasts and plump legs, making them a better-than-average table bird. Hens are outstanding winter layers, averaging 120 to 180 large brown eggs per year. They are broody and attentive, devoted mothers. The Wyandotte is an all-American chicken. First called American Sebrights, they were developed in an area of upstate New York once occupied by the Native American Wendat tribe, which inspired the eventual name that was admitted to the APA Standard of Perfection in 1883. Four breeders in New York, Michigan and Massachusetts developed the original Silver Laced Wyandotte. Nowadays, large-fowl Wyandottes come in nine APA recognized varieties: Black, Blue, Buff, Columbian, Golden Laced, Partridge, Silver Laced, Silver Penciled and White. For bantams, the same nine colors are recognized, with the addition of Buff Columbian. The American Bantam Association recognizes all 10 of the APA-approved bantam colors, as well as Barred, Birchen, Black Breasted Red, Blue Red, Brown Red, Lemon Blue and Splash. All have yellow skin and shanks. Wyandottes weigh about 8½ pounds for roosters and 6½ pounds for hens. They have frost-resistant rose combs and grow lots of down under their fluffy outer feathers, the better to keep themselves toasty warm. They have well-rounded, meaty bodies and mature faster than the average heritage breed. Hens are outstanding winter layers of large brown eggs, averaging 180 to 200 eggs per year. Some strains are broody; some aren’t. Wyandottes make stellar free-range foragers during the summer months, and they tolerate confinement exceptionally well. If you live in a section of the country where the winter temperatures fall below freezing, snow and ice arrive early and stay late and the sun takes a vacation, and you still want eggs for breakfast, consider getting cold-hardy layer breeds, such as the Brahmas, Chanteclers and Wyandottes. 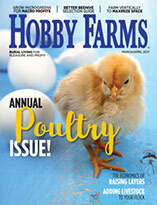 Australorps, Delawares, Hollands, Langshans, Naked Necks, New Hampshires, Orpingtons, Sussex, most Rhode Island Reds, and some Icelandics and Swedish Flower Hens have large, single combs that are prone to frostbite; the smaller single combs of Cochins, Jersey Giants, Plymouth Rocks and Welsummers can freeze but usually don’t. A few winter-hardy breeds such as Brahmas, Cochins, Faverolles and Langshans have feathered legs and toes that are mud and ice magnets, so they shouldn’t go out and wade in midwinter slush.